They brought out the big guns! Drug Czar John Walters descended on the Illinois Legislature this morning to argue against Illinois’ medical marijuana bill in the Human Services Committee hearing. It was a bit of a circus with about 120 in the audience with only 100 chairs — mostly supporters of the bill, but also such opponents as Judy Kreamer of Educating Voices and an entourage that she brought (including kids). The end result was unfortunately a 4-7 vote against moving the bill out of committee. We’ve got more work to do, but Illinois is definitely going to have a medical marijuana bill eventually. Of course, there was tons of misrepresentation and some outright lying. There were also some incredible moments and testimony. John Walters: Walters started out by invoking Lincoln, no less, in an outrageous effort to cover the fact that he was invading Illinois. He talked about Lincoln’s statements about the importance of following the law and that failing to follow the law would be destruction from within — an offensive statement that implied that Illinois’ law would be a destruction of law. He then said he was not here to “improperly influence legislation.” Right. He talked the usual stuff — standards of efficacy and safety, always using the words “smoked marijuana,” essentially denying the existence of other methods of ingestion. He used his standard “well, crack cocaine would probably make you feel better, too” line, and inferred that medical marijuana supporters were trying to “fool [patients] into alleviating their problems” with marijuana. He talked about the IOM study from his perspective without mentioning the other parts. He mentioned Marinol. Then he used his traditional big guns. He said that marijuana is the drug that most suffers from ignorance about it, mentioned that “it’s not your father’s marijuana.” Then the big lie. “More teenagers are seeking treatment for marijuana use than any other drug.” That is a complete fabrication. The teenagers are not seeking treatment — they’re being referred there by criminal justice and schools and such. Anyway, he went on for about 45 minutes, along with answering some questions from committee members. One response that struck me, is that he was talking about all the new drugs that are being developed all the time that negate the need for medical marijuana, including some new derivatives of opium! Instead of marijuana, use opium??? Rep. Connie Howard came out with a strong statement in support of the bill, talking about the need to do something to deal with the pain, and brought up the point about Vioxx being approved by the FDA and causing deaths, so why was Walters talking about the only way to go being through the government process? Here he is, sitting next to Judy Kreamer, who seemed not only to be a close personal friend, but also to be there to make sure he didn’t drool. By the time The Drug Czar was done, he had taken up so much time that the proponents were told to rush through their presentations. This made the following segments a bit disjointed. Representative McKeon: Representative McKeon, who sponsored the bill mostly deferred to the other speakers, but jumped in now and then to focus on a point, and did a pretty good job in the press conference afterward. Dr. Bruce Doblin: Dr. Doblin gave a good informational presentation, although a bit dry as he read from his paper. He mentioned that he works with hospice patients and that 50-70% of cancer patients do not receive sufficient pain medication. He also mentioned that studies from around the world supported medical marijuana (he specifically talked about the IOM study and the report from the New England Journal of Medicine). Dr. Edward Lack: A Chicagoland area physician who has worked with 300,000 citizens, including 1,000 patients with cancer (very personable man). In 2002 he was diagnosed with cancer himself. He noted that one of the biggest problems that cancer sufferers face is the fact that chemotherapy is so horrible, that many of them don’t continue with the treatment that could save their lives. And yet marijuana makes it bearable. He noted that he could get marijuana easily from his son in college if he wished, but why should he have to do it that way. “Why are people so afraid of this plant that they would deny me relief?” “Do not put the fears of an ambivalent society on the backs of sick people.” He was asked a number of questions about details in the bill and replied that his job was to help the sick, and that it’s the legislators’ jobs to craft the bill. Julie Falco: Wonderful testimony from a woman with multiple sclerosis who takes her marijuana cooked in brownies. She talked in detail about how it helped with her stiffness, pain, and even the excessive sensory stimulation that is part of MS. For more about her, read Steve Young’s excellent article in the Reader. Irvin Rosenfeld: This is the Ft. Lauderdale, FL stock broker who is one of the remaining 7 patients in the federal government’s compassionate marijuana program. (He appeared on Montel a while back.) He’s a dynamo, and it’s very impressive to see him show off his legal marijuana shipped to him by the federal government in tins — enough for 10-12 marijuana cigarettes a day. He talked about the fact that the government has specifically NOT been interested in studying him or the other 7 — that they don’t really care about the truth. 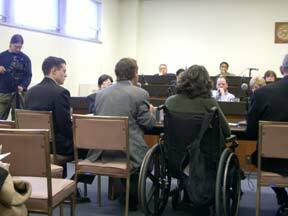 Very strong points – outstanding testifier. And the press really loved this guy and everyone was impressed by seeing the can full of marijuana cigarettes in the state capital. However, two State Capital police were unimpressed and detained Irv after the hearing until he could convince them (he had them call the DEA) that his marijuana was legal. Representative McKeon was livid over his treatment. Matt Atwood: Finally, Matt Atwood testified, and he was there to provide the nuts and bolts and deal with the specifics of the bill, but unfortunately by this time nobody was listening, and he was being hurried through it, so he got a couple of good details out, but not enough. Representative McKeon made it very clear at the press conference that happened at noon (the opponents didn’t stick around for it) — medical marijuana is not going away and it will be passed. Several of the Representatives who voted “no” did so while stating that they are sympathetic with the overall viewpoint, but merely disagreed with language or implementation. So there’s plenty of reason to hope. He also mentioned how impressed he was that the federal government was scared enough to send a cabinet official (drug czar) at taxpayer expense all the way to Illinois for a mere House hearing. Walters’ appearance did appear a bit last minute. I kind of wondered — did my take-down of Andrea Barthwell make her damaged goods (she wasn’t there and was being kept up to speed by cell phone)? Maybe they had to call up the Czar at the last minute to come on down? That’s probably all it would take. After all, these people have this nice little incestuous network. 1 comment to They brought out the big guns! Bensinger graduated from Yale. Proof that a Yale diploma does not equal intelligence.